GirlForward's work is made possible by individuals who donate in support of our mission. Your support provides everything from the books girls read during Camp GirlForward to bus fare during the school year to matching girls with dedicated mentors. GirlForward is a 501(c)(3) non-profit organization. Tax ID: 45-2987277. You can view our financial information on Guidestar by clicking here. Any checks can be made out to GirlForward and sent to our mailing address at GirlForward P.O. Box 607516 Chicago, IL 60660. Have any questions? Feel free to call our Chicago HQ office at (773) 856-0598 or email our Donor Relations Manager, Parnian Shiraz, at parnian.shiraz@girlforward.org. A recurring donation is a sustainable investment in the lives of girls who are refugees and immigrants. Create a monthly donation that works for your budget and makes a meaningful contribution that enables GirlForward’s community to thrive. Check to see if your gift could have twice the impact! GirlForward is often also looking for the following supplies. You can always create a donation drive and enlist friends, family, or coworkers to contribute. Please email chicago@girlforward.org or austin@girlforward.org if you can supply these items! School supplies including looseleaf paper, notebooks, pens, pencils, binders, and backpacks. Snacks for our after school centers! Girls love popcorn, granola bars, vegan/halal fruit snacks, peanut butter or cheese crackers, and Takis! Personal hygiene products such as deodorant, lotion, and hair bands. Cleaning products to keep our spaces fresh and clean such as clorox wipes, hand soap, toilet paper, paper towel, and tissues. When you donate your birthday to GirlForward you're investing in the potential of girls. The funds you raise goes towards facilitating programing and providing transportation for girls to go to and from our program center, snacks for after-school, literature books for Camp GirlForward, workshops, and much more! On Facebook: Create a fundraiser asking friends to donate instead of giving you gifts. Donate: Make a donation in your own name, honoring your special day. Ask: Collect monetary donations from your guests or have them bring items to donate to GirlForward such as school supplies. Plan an event: Access our toolkit and information on how to host your own GirlForward fundraiser. 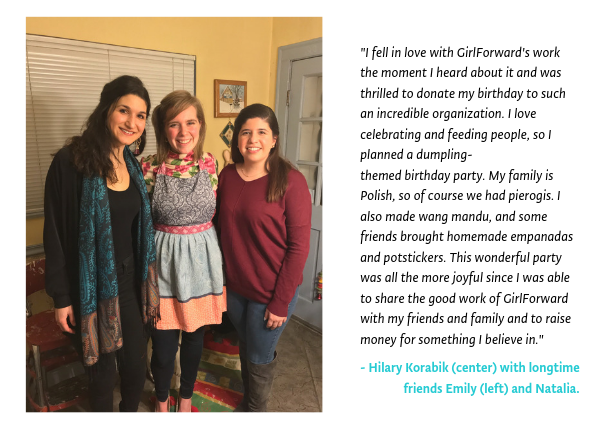 Check out some birthday party inspiration from a GirlForward supporter, Hilary! If you would like to make a gift to GirlForward in honor of or in memory of someone in your life, you can donate here and then please follow up with an email to parnian.shiraz@girlforward.org to notify us of your gift. In the email please include the contact information and mailing address of the family or honoree so that the appropriate contacts can receive a mailed acknowledgment from GirlForward. Are you passionate about making a more welcoming community for refugees and immigrants? Want to help GirlForward increase our impact and provide hundreds of girls with mentors, friends, and safe spaces? You can make a difference by hosting a fundraiser. Even if you've never raised money before, we're here to help! Check out our event kit and brand guidelines to get started.